ROTTERDAM, The Netherlands, May 1, 2014 (ENS) – Early this morning, 80 Greenpeace activists confronted the tanker carrying the first shipment of oil from the Russian Arctic. During the demonstration, the Greenpeace ship Rainbow Warrior was boarded by Dutch security agents in the Port of Rotterdam and 44 activists were taken into custody. The agents forcibly entered the Rainbow Warrior’s communications room and towed the ship to shore after it intercepted the Russian tanker, loaded with Arctic oil. The 258-meter-long Russian tanker Mikhail Ulyanov is carrying the first oil from Gazprom’s Prirazlomanaya platform in the Arctic Pechora Sea to a refinery in Rotterdam. At 6am, four activists on inflatable boats approached the tanker and painted “No Arctic Oil” in large white letters on the hull. 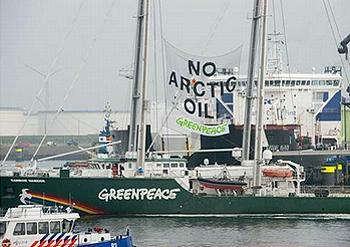 A second Greenpeace ship, the Esperanza, took part to provide logistical support to the activists. A total of 44 activists, including crew members onboard the Rainbow Warrior and activists in inflatables were detained after they tried to block the tanker from docking. Greenpeace Captain Peter Willcox is among them. Willcox is one of the Greenpeace “Arctic 30.” These 28 activists and two freelance journalists were arrested by Russian authorities in September 2013 as several of them attempted to scale the Prirazlomanaya platform to hang a banner protesting oil drilling in the fragile Arctic ecosystem. Seven members of the Arctic 30 took part in today’s protest in Rotterdam. Willcox, a U.S. national, was captain of the Greenpeace ship Arctic Sunrise on which the Arctic 30 traveled to the Pechora Sea. Russian authorities towed the Arctic Sunrise to a port in Murmansk, where it has remained for more than six months. Greenpeace contends the ship is illegally detained. The Arctic 30 were jailed for over two months on charges of piracy and then hooliganism. They were released under the terms of an official amnesty. Demonstrating the importance of Arctic oil exports to Russia, President Putin himself gave the command by phone to start loading the first Arctic oil onto the Mikhail Ulyanov. 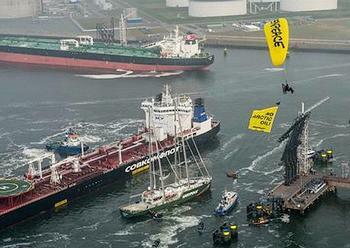 The shipment is on its way to Russia’s first customer, the French company, Total, Greenpeace revealed. The international environmental organization worries that the Prirazlomanaya platform is located 50 kilometers (30 miles) from a nature reserve and that the Arctic environment is too fragile and vulnerable to recover from an oil spill. But Gazprom Management Committee Chairman Alexey Miller says that the design of the Prirazlomnaya platform secures every oil processing operation, excluding the chance for any oil spills during the production, storage and loading processes. The oil is stored in specially constructed and reinforced caissons and a wet method of storage at the platform eliminates the possibility of oxygen getting inside the tanks, creating an explosive environment, says Gazprom. In addition, special equipment was developed for transfer of the oil to tankers for transport. But spills are not the only danger. Greenpeace argues that burning Arctic oil will increase the impact of climate change, already threatening ecosystems around the world.